The story and history of Saint Heliodorus. This Saint was born at Dalmatia, St. Jerome's native country, and soon sought out that great Doctor, in order not only to follow his advice in matters relating to Christian perfection, but also to profit by his deep learning. The life of a recluse possessed peculiar attractions for him, but to enter a monastery it would be necessary to leave his spiritual master and director, and such a sacrifice he was not prepared to make. He remained in the world, though not of it, and, following the example of the holy anchorites, passed his time in prayer and devout reading. He accompanied St. Jerome to the East, but the desire to revisit his native land, and to see his parents once more, drew him back to Dalmatia, although St. Jerome tried to persuade him to remain. He promised to return as soon as he had fulfilled the duty he owed his parents. In the meantime, finding his absence protracted, and fearing that the love of family and attachment to worldly things might lure him from his vocation, St. Jerome wrote him an earnest letter, exhorting him to break entirely with the world and to consecrate himself to the service of God. But the Lord, Who disposes all things, had another mission for His servant. After the death of his mother, Heliodorus went to Italy, where he soon became noted for his eminent piety. He was made Bishop of Altino, and became one of the most distinguished prelates of an age fruitful in great men. He died about the year 290. 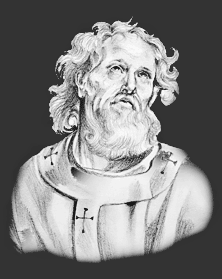 The Feast Day of Saint Heliodorus is July 3. The origin of Feast Days: most saints have specially designated feast days and are associated with a specific day of the year and these are referred to as the saint's feast day. The feast days first arose from the very early Christian custom of the annual commemoration of martyrs on the dates of their deaths at the same time celebrating their birth into heaven.